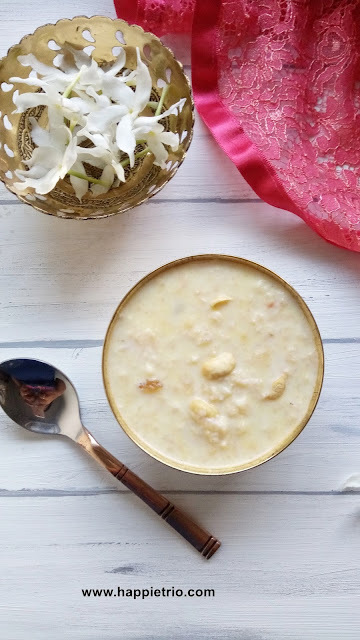 Apple Kheer Recipe | Apple Payasam Recipe with step by step photos. Starting this month with a delicious Kheer made with apple. This is one of my favourite chilled dessert .Even this is toddlers friendly. Can be served to kids above 1 year. If you really hate apple, try this kheer I bet you will change your opinion and start loving apple. I used my Preeti Turbo chop to grate the apples. It is so handy and apple can be grated in just minutes!! 1. Wash the apples peel the skin and grate them and set it aside. Take a pan heat in the heat fry the cashew nuts and raisins together once they turn golden and raisins plump up remove them from ghee and set aside. 2. Next to the same pan add in the grated apple and sauté in ghee till it becomes soft in a low flame. It may take around 7-8 mins. Set the apple aside and let it cool completely. In a sauce pan add in the milk and bring it to a boil once it starts boiling simmer the flame and allow it to cook in a low flame. 3. Continue in a low flame for another 10 mins, Let it become lightly thick next add in the sugar and condensed milk and mix well. 4. Now add in the ghee roasted cashews and raisin’s and mix well now switch off the flame and allow to mix to cool completely. Make sure the apple and milk are completely cooled down . 5. Now add in the apple to the kheer and mix well.Add in the Cardamom powder as well and mix well. Switch on the stove and in a very low cook for another 5 mins and switch off the flame. · Make sure you don’t add the apple to the milk when it’s hot. Both the apple and Milk should be at room temperature otherwise the milk might get curdled. · The curdled milk will spoil the entire kheer. · Apple kheer tastes best when served chilled. · You can also add saffron strands to make to make it more rich. · If you are going to give the kheer to toddlers you can steam cook the apple instead of sauteing in ghee and then add to the kheer. Enjoy this delicious and healthy Apple Kheer !! That's an interesting twist to the payasam with apple..sounds so yummy! This is one of the recipe in my todo list. Apple Payasam looks so yummy. This kheer is something that I have wanted to make for a long time but have been afraid I might end up curdling the milk. I will try this method soon. Looks so creamy and delicious. Very interesting payasam. Going to try soon.. Thank you for sharing all the tips for making this payasam... sounds like a good idea especially now that there are so much of apples in the market... pinned! I remembered an old film called Khubsoorat where this apple kheer was discussed. My intro to this kheer somehow never tried it. Looks and sounds delicious. Apple kheer looks absolutely super creamy and lovely twist to our humble kheers. I can only imagine how delicious this must be! I like the idea of cooking the apples separately. I love making apple kheer. Delicious knee dear! Yumm way to sneak in apples! condensed milk takes this kheer to another level :-) totally loved it !